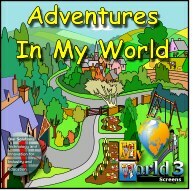 Adventures in My World is an exciting new application for use with My World 3 designed to support the Key Stage 1 curriculum. By clicking on the screen children can visit 6 areas - a house, a garden, a farm, a village, a playground and the woods - and you can never be sure what you will find there! Each area contains a huge variety of curriculum based activities designed for key Stage 1, focusing particularly on numeracy, literacy and science. Children will find puzzles and pattern making, sound matching and counting, enhanced by outstanding graphics and animations. Each screen has spoken as well as written instructions, making it suitable for the youngest children. There is a teachers guide showing how the activities link to the curriculum which will facilitate lesson planning. For younger children who need practice in basic skills such as mouse control there is also a great deal to be gained from free exploration - by having an Adventure in My World.